The doctrine of original sin leads to one of two conclusions: God’s Sovereignty in salvation, or an Arminian version of prevenient grace. Both Calvinists and Arminians say they believe in original sin. Adam was the father of the human race, and when he sinned, his sin was imputed to all of his children, including you and me. Adam died spiritually, and all humans ever since have come into the world dead in sin, with no righteousness whatsoever, and no thirst for God at all. For Calvinists, the conclusion is simple. Before we can become believers, the heart of stone must be replaced with a heart of flesh (Ezekiel 36:28). Until God works regeneration in a person’s heart, faith in Christ for salvation is impossible (John 6:44). But after God regenerates the heart, a person will certainly come to Christ and be saved (John 6:37). Whether dead in sin or alive to Christ, we always choose according to our nature. Arminians, though, do not accept the doctrine of election. They do not believe that God is Sovereign over the salvation of people. Therefore, they do not follow the doctrine of original sin to a Calvinistic conclusion. They bypass the Scriptures that speak of God’s Sovereign control over whom He will save, and whom He will not. Instead, to fill the gap, they postulate the doctrine of “prevenient grace”, which I hope to show is without biblical warrant. 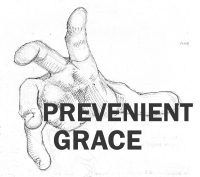 The word “prevenient” (or “preventing”) means “coming before, preceding, or antecedent.” According to Wesleyan/Arminianism, God’s prevenient grace counteracts our total deadness in sin, but doesn’t totally regenerate us either. According to Arminians, God awakens us even in our unregenerate state, so that all sinners have a real “chance” to turn to God for salvation. But Arminian prevenient grace does not guarantee salvation. According to Arminians, God gives prevenient grace to everybody, hoping that some will respond and be saved, but knowing that most will choose to return to spiritual death. The Arminian doctrine of prevenient grace fits into their overall scheme of theology and enables them to maintain the doctrine of original sin and yet reject God’s Sovereignty in salvation, therefore rejecting unconditional election as well. But the biggest problem with Arminian “prevenient grace” is that there is no clear Biblical support for it. Not once does Scripture speak of prevenient grace that “enables” salvation without also assuring salvation. The doctrine seems nice to Arminians, but can be found nowhere in the Bible. “Woe to you, Chora’zin! woe to you, Beth-sa’ida! for if the mighty works done in you had been done in Tyre and Sidon, they would have repented long ago in sackcloth and ashes. And you, Caper’na-um, will you be exalted to heaven? You shall be brought down to Hades. For if the mighty works done in you had been done in Sodom, it would have remained until this day. Note that God did in fact forsee that the people Tyre and Sidon “would have repented”. (Apparently the people in Sodom would have repented too.) They were blinded by Satan (cf. 2 Cor. 4:3-4), but God knew for sure that they would repent if only He would send miracles. And yet, what was God’s “response” to His foreknowledge about these people? Did He predestine them to salvation? Did He respond to foreseen faith by sending miracles so that they would repent and be saved? Not at all! The doctrine of “prevenient grace” suggests that God really wants all people to receive salvation, and that He is really “doing all He can” to get the job done. Arminians suggest that God weeps over all lost souls, and that He sends His prevenient grace to all of them, just hoping that some of them will respond. But the God of the Bible is very different from this! Here we see in Matthew 11 that God *knew* what it would take for many people to repent and be saved, and nevertheless *withheld* it! That doesn’t sound like God is “doing all He can” to me. And it certainly doesn’t bode well for the man-centered doctrine of “prevenient grace”. Note that this particular passage is talking about conversion, and the forgiveness of sins. And note that Jesus does *not* want some people to be converted; He does not want them to have their sins forgiven. He forsees that they would have faith if they truly understood His message, but He explicitly says that He uses parables so that they will *not* understand Him. Again, God does not respond to foreknown faith by predestining them! * Arminians think that God wants as many people to repent and be saved as possible, and that He gives all people “prevenient grace” to enable the salvation of all people. The above two statements are completely in opposition to one another. Arminian “prevenient grace” is a doctrine that directly contradicts the Scriptures. In Matthew 11:21-27, we can see that God sometimes withholds things from people, even when He knows that those very things would have brought people to repentance. These actions of God do not sound at all like the actions of Someone who wishes to enable the salvation of everybody. In Mark 4:11-12, we can see that Jesus intentionally spoke in parables, instead of plain language, so that many people would *not* understand, repent, and be forgiven. This is clearly the opposite of Arminian prevenient grace. Multiple other passages could easily be brought to the table. But the two Scriptures above are quite effective, in that they offer evidence that directly opposes the idea of Arminian “prevenient grace”. This article makes up a chapter in the book, Still Sovereign, edited by Bruce A. Ware and Thomas R. Schreiner. His chapter in this book offers an excellent refutation of the Arminian “Prevenient Grace” doctrine.